For the impatient among you, click and run MonoDevelop.app.zip. It requires Mono 2.4 for OSX, on the upside, you can use this to develop ASP.NET MVC apps on the Mac. 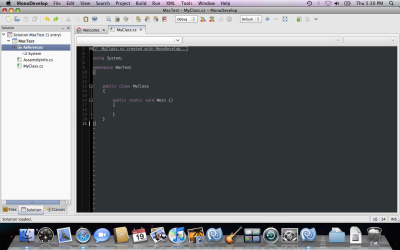 Super-Alpha-Preview of MonoDevelop on OSX. The Menu bar was embedded in the window. The keyboard accelerators were the Linux ones. They felt unnatural for OSX users, and also did not take advantage of the spare key (Command) to liberate the control key for other uses. The editor behaved like a Linux editor. There is a vibrant Mono on OSX community out there, and it will only grow larger. We wanted to make sure that all of the work that is going into creating a great IDE is available for folks on the Mac in a way that is actually comfortable to use. So working with folks in the Mac Community and with folks at Unity Michael has been working on tuning up MonoDevelop on the Mac to become an editor that does not get in the way of Mac users and developers and integrates better from the "feel" perspective with other tools in the OS. For instance, not only does the new MonoDevelop for MacOS use the Mac menu bar, and the Mac accelerators (a combination of XCode and Textmate accelerators), but even the text editor has been altered to support the way selection and navigation works on the Mac. I figured that for every 100 users of MonoDevelop one of them will contribute patches back to the effort. If you happen to be that 1% hacker that will contribute back, you might want to look at a list of ideas to improve MonoDevelop on the Mac. MonoDevelop on Windows is on a similar boat: the 2.0 release works "out of the box" on Windows, but again, it is a GNOME IDE in a Windows land. Stay tuned for news from the MonoDevelop community as to what will happen there. Update: Lluis posted an update on the progress of MonoDevelop on Windows.